In Judges 5 we are introduced to the song of Deborah, one of the few notable judges during the dark period of time for the Israelites. After the death of Joshua, there was no clear prominent successor like he was to Moses. Instead, God raised judges to lead and save the Israelites time and time again, yet after the death of each judge, the Israelites would spiral into a cycle of forgetting and turning back against God, before suffering comes and another judge saves them again. In her song, which can be regarded as a victory hymn after the defeat of the Canaanites, Deborah listed out the deeds of the various tribes of Israel when she rallied for help. 6 tribes participated – Ephraim, Benjamin, Makir (son of Manasseh, Joseph’s firstborn), Zebulun, Issachar and Naphtali. Gilead, Dan, Reuben and Asher were the four tribes that did not. In this study, using the context of the Israelites then, we will examine the actions and decisions of the three tribes mentioned in this verse and learn what we can apply from them in our modern lives today. 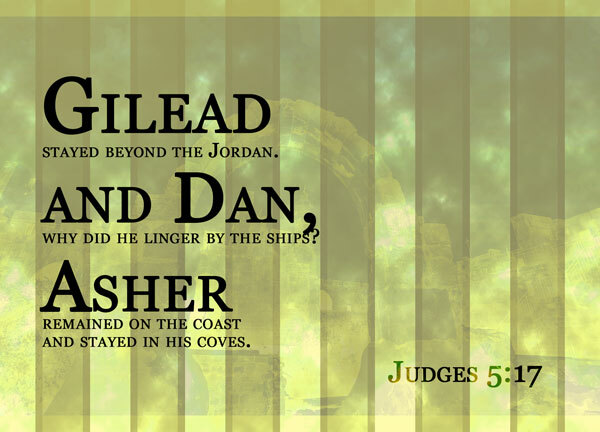 Gilead stayed beyond the Jordan – First, Gilead – by and large understood to be descendants of Manasseh, who resided east of the Jordan River. Having stayed on the other side of the river, over time they became distant from the fellowship of Israel. We see many examples of this over the course of history, when a river is signficant enough that it forms a natural territorial marker and a nationalistic divide between the two lands. While Gilead was in name still a part of Israel, they certainly had a spiritual disconnect, manifested through the physical marker – the Jordan River. So when it was time to rise up, they couldn’t. And Dan, why did he linger by the ships? – All their lives, they took the easy way out. Numerically, though Dan was the second largest tribe after Judah according to the first Census, the territory allocated them wasn’t very large, and was often under threat by the Philistine. To negate the territorial pressure from the Philistine, they went further and further away. In fact, they went so far north away from the Promised land given unto them because they got tired of the hard life with the other tribes. Dan was also the tribe most known for their idolatry and pagan practices. We know that they actually went so far away from God’s plans that they went right out of it. In Revelations 7:4-8, Dan was the only tribe out of the original 12 not listed amongst the tribes of Israel that were sealed. Asher remained on the coast and stayed in his coves – Asher had always been a prosperous tribe – the land they were given was along the coast and had regular rainfall, and thus was the most fertile – the blessing of Jacob to Asher was Asher’s food will be rich; he will provide delicacies fit for a king [Gen 49:20]. They were also known to be connected to the markets of Phoenica – a state known to have ruled the coasts, where the tribe of Asher was by. Yet historically, they were known to be seldom embroiled in the political or territorial affairs of Israel. They had no spiritual, or to modern ‘Asherites’, Biblical, vision of life. They could not say goodbye to their materialistic life, and placed greater importance in their own distractions and their prosperity than the matters of the Lord. When the time comes for God to issue his challenge, they couldn’t respond. For a variety of different reasons, we see a common theme between the three tribes discussed (the tribe of Reuben was quite a different case) – one of the main factors why they did not respond to Deborah’s rally was because they were too far removed from the fellowship of the Israelites. For Gilead, it was a physical boundary that extended to their spiritual distance. For Dan, it was their lethargy and their attitude of taking the easy way out – hence taking things into their own hands. It is the reverse – their spiritual distance manifested in a physical distance. For Asher, while they were never physically distant, they were always emotionally and spiritually distant, with a self-centredness and a sense of materialism. Away from the fellowship of the Israelites for so long, they couldn’t respond to the call. How could they? There was no connection, they didn’t see a need, it wouldn’t benefit them. And hence they walked not in the will of the Lord. A solitary Christian life is a myth. It cannot be believed. Christians have a responsibility of building each other up – helping each other, encouraging each other. When we lead a solitary Christian life for an extended period of time, we tend to fall away. Let us learn to embrace the Christian fellowship with our fellow Christians, so when the time comes for the Lord’s call, we will be aware, and we will be able to respond to it.